In last few years we have moved from slow dial-up internet connection to super fast broadband internet connection. Technically an internet connection over 512kbps speed is called broadband. Now it is possible to get fast wired or wireless broadband internet connection, thanks to 3G and 4G mobile technology. Internet service providers (ISP) are offering attractive internet speed packages. But are you really getting the speed promised by ISP? Some Internet Service Providers limit internet speed and some services. Here are best websites to test internet connection speed. Run broadband internet speed test on these websites to find out real internet connection speed. It is most popular website to test internet speed. After visiting the site select a nearest host to perform speed test. Most of the time speed test results are very accurate. Speedtest.net also tests internet’s upload speed and ping time. You can compare and share internet speed test results after doing the test. Speakeasy is another popular website to find out real internet speed. Here you just select server location to start the test. After performing speed test you can share the result with friends using Facebook, Twitter or LinkedIn. One drawback of this site is that all servers are located in USA so you may to get correct results unless you are living there. This is relatively new website with some useful internet related utilities. You can test internet connection speed here. It has simplest user interface, just click ‘Start speed test’ button to initiate the test. It checks internet download and upload speed and shows result after test. In Know IP Address you can find your computer’s IP Address and view location map too. Bandwidth Place offers broadband speed testing functionality. 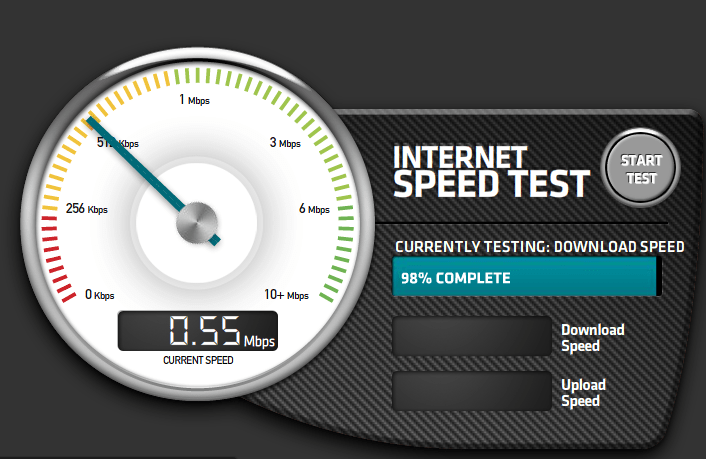 This site is very simple, it just tests and shows internet download and upload speed. It does the job very easily. Have you tested your internet connection speed? are you getting promised download and upload speed?